Mansa district was formed on 13th April 1992 from the erst while district of Bathinda. Mansa is a small district both in terms of population and area. It is situated on the rail line between Bathinda-Jind-Delhi section and also situated on Barnala-Sardulgarh-Sirsa Road. Mansa is well connected to the capital of India as well as Punjab. The nearest airports are located at New Delhi and Chandigarh which are 248 km and 180 km away by road respectively. Mansa is located at 29.98°N - 75.38°E. It has an average elevation of 212 metres (695 feet). The records are not available which could provide the exact date of establishment of the civil/criminal courts at Mansa (Punjab). Howeever, from the Mansa District Gazetteer, the Bar Association at Mansa is said to be oldest one, which was formed in the year 1929. Thus from this fact, it can be assumed that civil and criminal courts would have been there since 1929. Judicial Officers : District & Sessions Judge or Sub Judge/Magistrate - Shri R.P.Nagrath was the first District & Sessions Judge, Mansa, who assumed his office on 17.09.2005. After that the court of Additional Civil Judge (Senior Division) was established at Sardulgarh on 25.02.2006 and Budhlada on 19.05.2007. Building : Mansa was declared as Sub Division in the year 1956. At that time, India didn't had much infrastructure and most of the officers used to stay in Sarains or private buildings and so was the scenario in Mansa. There were no official residence and officers used to stay in rented buildings or elsewhere. 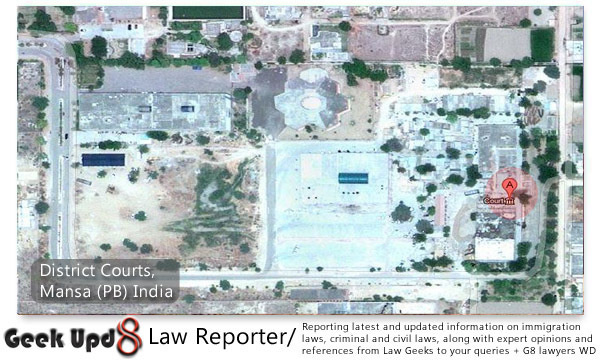 The present scenario is completely different, the aerial view of the Mansa court is visible in the image above (Courtesy - Google Maps). A big complex have been constructed for the courts. It is situated in the outskirts of the city and is on the way to Bhikhi. The office of Deputy Commissioner is also in the complex. The official residence have been provided to the Judicial Officers. As said above the exact date of establishment of Mansa Bar is not known, but it is said to be one of the oldest bar known. The Bar Association has produced two Hon’ble Judges from the Mnsa namely Shri Kulwant Singh Tiwana (Retd.) and Shri Madan Lal Singla, (Retd. ), the Hon’ble Judges of Punjab & Haryana High Court. 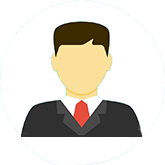 The present day scenario is that around 500 lawyers are practicing at District Courts. 1 Sh. Gurbir Singh District & Sessions Judge Mansa. 2 Ms. Rupinderjit Chahal Addl.District & Sessions Judge Mansa. 3 Sh. Raj Kumar Garg Addl.District & Sessions Judge Mansa. 4 Sh. Sanjiv Joshi Civil Judge-Senior Division Mansa. 5 Sh. Ashok Kapoor Chief Judicial Magistrate Mansa. 6 Sh. Balwinder Kumar Addl.Civil Judge-Senior Division Mansa. The information on this page has been extracted from various sources, including the websites listed below. The content is intended only as general information and should not be relied upon for any other purpose.